Along with the Jenny Creek Trail, the Guinn Mountain Hut are accessible via the Eldora Ski Area, and are excellent trainers for a Tenth Mountain Hut trip. The Arestua Hut is maintained by the Colorado Mountain Club. You cannot make reservations for overnight use, so the hut is available on a first come - first served basis. It is a very small cabin, so it can get extremely crowded if two groups show up for the same night. To help mitigate this, you can visit either the reservation calendar to see if people will be using it on a particular night. To make a reservation you can send an email to the hutmeister. the hike, this will require skins on the way back up, which is a minor bummer. Looking at it with some satellite imagery, you can see that you skirt up the side of Eldora Ski Resort before turning up the mountain. One nice part about this hike is that it is relatively easy to enter the resort and ski to your car at this point. Of course, click here if you would like to view this trail on Google Earth. Below you can find the necessary files to go on this hike. This page is awesome! Thanks Momo! 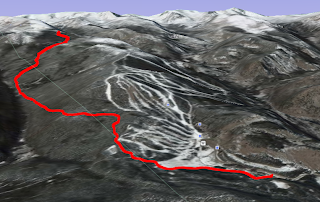 I am planning a x country trip from Eldora up past Arestua and on to Winter Park. Can someone tell me where I can leave my car in the Eldora area. Is there overnight parking at the trailhead? 2> There is a parking lot for the nordic center/guinn mountain hut located near the "eldora" sign which marks the main entrance to the ski resort. you will see the parking lot I am talking about. Hi. Just wanted to let you all know I visited the hut today. Everything looked OK. The door was not latched and I left it that way. Turns out, it was a dog that had been frightened during a hike and ran off. Thankfully their is a happy ending. I was able to track down the owners through the Gilpin county sheriff. Whoever is there next can discard the note. Nice hut! I didn't even know it was up their. Maybe I'll see some of you their this winter. Keep up the good work! Dogs are not allowed on The Jenny Creek Trail or the Guinn Mountain Trail from Dec 1--April 30 by USFS ARNF orders, please respect other hut users and leave your dogs at home. Dogs compromise the water supply issues at the Arestua Hut. The CMC maintains a page for the Årestua hut.